The land around the today's city of Cernavodă is full of ancient remnants. The first researches began in 1917 in a tell belonging to the Gumelniţa culture, by the German archaeologists Carl Schuchardt and Paul Träger. In 1936, the archeologist Ion Nestor started a series of diggings both in the Gumelniţa tell and on the slopes of Sofia Hill, a promontory situated on the Danube's shore, north-west of Cernavodă. The research on the Sofia Hill, resulted in the discovery of three distinct cultures, Cernavoda I,II,III , from the late Eneolithic and from the transition period to the Bronze Age. Here were also found signs of habitations belonging to the Boian and Gumelniţa cultures, and an incineration tomb covered with stones from the Hallstatt period. Axiopolis ("dark city") was a settlement founded by King Lysimachos. But the generic name of Axiopolis actually represents three fortresses from different ages, so far not studied enough. The most important, the one from the Roman period, is placed at Hinog, on the high plateau on the right side of the Danube. The fortress of Hinog was part of the defensive Danubian system, the Scythian limes. The diggings of 1898 – 1899 revealed the walls of three fortresses and some interior buildings, such as two churches. The three fortresses lie one above another, evidence of the helenistic, roman-Byzantine (4th-5th centuries) and early feudal (10th-13th centuries) periods. A Greek inscription from the first years of the 4th century mention three Christian martirs : Chiril, Chindeas (Chindeus) and Tasius (Dasius), but their remnants were never found. Between the Columbia hill and the "Coada Zăvoiului" point, were found a couple of settlements and a necropolis with more than 400 tombs belonging to the Hamangia culture. 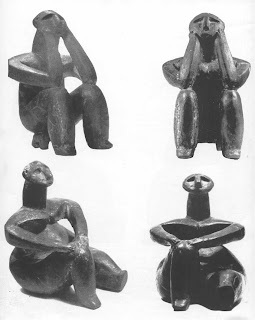 The most famous findings are the terracotta figurines "The Thinker" and "The Sitting Woman" (2nd half of the 5th millennium - the begining of the 4th millennium BC). Some old photos can be found on the Digital Archives of Archaeology website. Two old photos follow and this time the aerial map from Wikimapia with some more info and a few photos.